Ingrid Radke-Azvedo was born in the heart of Germany in 1934. As a small girl, Radke-Azvedo enjoyed what most young children do: playing with dolls, spending time outside and creating rich fantasy worlds in her mind. What separates Radke-Azvedo from other girls her age was that she grew up in the shadow of one of history’s cruelest dictators, Adolf Hitler. While not Jewish, Romani or any of other dozens of groups that Hitler and the Nazis flagged for execution, Radke-Azvedo came face-to-face with the brutal reality of Nazi Germany when her mother decided to allow a Jewish scientist to live in secret in a house that the family owned. Radke-Azvedo remembers being sworn to secrecy by her mother and told never to tell anyone what the family was doing. Even at the young age of 5, Radke-Azvedo understood the consequences of breaking such a promise. The memory of what happened to that Jewish scientist still brings Radke-Azvedo to tears. She remembers going to check on him early one morning and finding the house a mess. Papers were strewn across the room where the doctor lived, his books were thrown to the floor. The only evidence of what happened was a puddle of blood on the ground. It was then that Radke-Azvedo knew she had to escape Germany and in her heart there was only one destination: the United States of America. Radke-Avedo was only able to successfully enter to the United States after several more years in war-torn Germany and as a 24-year-old. She survived aerial bombings, nazi troops and one of the largest genocides the world has ever seen to get here, but Radke-Avedo was determined and wanted nothing else in the world. 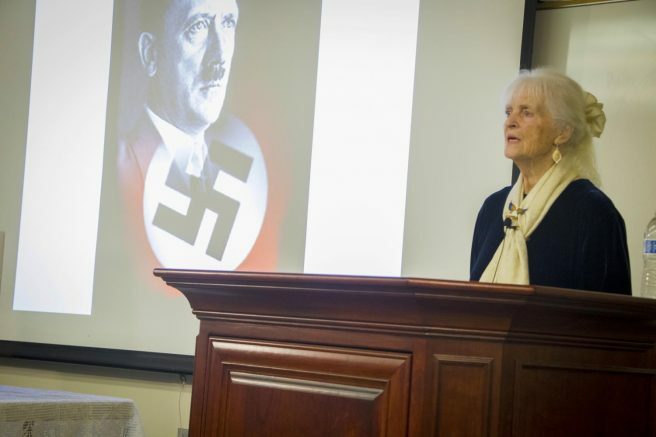 Radke-Azvedo recently sat down with The Current before delivering a College Hour speech on Nov. 9 at American River College to talk about her experiences and some of the lessons she learned from witnessing the birth and death of Nazi Germany. The Current: Writing your autobiography “Out of the Rubble” must have been extremely challenging. Did you find it difficult to not only re-live such traumatic experiences but to write about them for all the world to see? C: I imagine seeing scenes like that would leave you with a profoundly different world view than the average child your age. The odd thing here is that it seems to have left you with an almost positive view of the world, is that accurate? C: Why do you think that is? C: Where is the greed coming from then? C: Aside from political greed, do you see any similarities between the time we live in now to the era that you grew up in? C: Do you still have hope for the future though? C: Where does that hope come from? Be the first to comment on "Q&A with a German survivor of World War II"